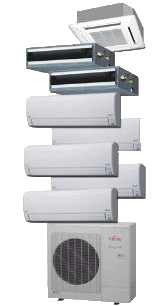 Ductless Mini Splits are a fast growing segment of our business. These high efficiency units are ideal for patio room, room additions or any application where zoning of the heating and cooling system is desired. Our customers love these units. They are super quiet and very efficient. Fujitsu's Halcyon HFI system provides home and business owners just the right amount of comfort needed by installing from 2 to 8 indoor units connected to one outdoor unit. Indoor units vary by size and style and each creates its own "zone" of comfort, allowing you to heat or cool individual rooms, hallways and open spaces. Here in Oklahoma, ductless air conditioners and heat pumps provide both heating and cooling for year round comfort in many climates. A simple push of a button on the remote control allows you to switch from heating to cooling (or vice versa) automatically. There's no need to have thermostat wars anymore! Halcyon HFI's zoning capability allows you to set each indoor unit to a different temperature - that means you can set up to 8 different temperatures as needed! Is your upstairs hotter than your downstairs? This system provides individual temperature control throughout your home or business so each room, zone or floor will be the temperature you set! Why pay to comfort rooms no one is in? With Fujitsu systems you only have to heat or cool the rooms you are using. Plus, HFI's high efficiency ratings (SEER, HSPF and EER) mean that they use less energy. The end result? Lower utility bills for you!